Mei: Mumei. Attributed to Noshu Seki Kanefune. Overall length: 23.11 inches (587.00 mm). Nagasa: 17.24 inches (438.00 cm) long. Nakago: Ubu, 5.87 inches (149.00 mm), mekugi-ana. The yasurime are katte-agari and the nakago-jiri is iriyama-gata. Kissaki: Chu-kissaki, 1.02 inches (25.90 mm). The boshi is komaru. Moto-haba: 0.84 inches (21.40 mm). Moto-gasane: 0.23 inches (5.80 mm). Saki-haba: 0.73 inches (18.70 mm). Saki-gasane: 0.15 inches (3.70 mm). Sori: 0.55 inches (14.00 mm). Hamon: A very flamboyant togari-gunome. 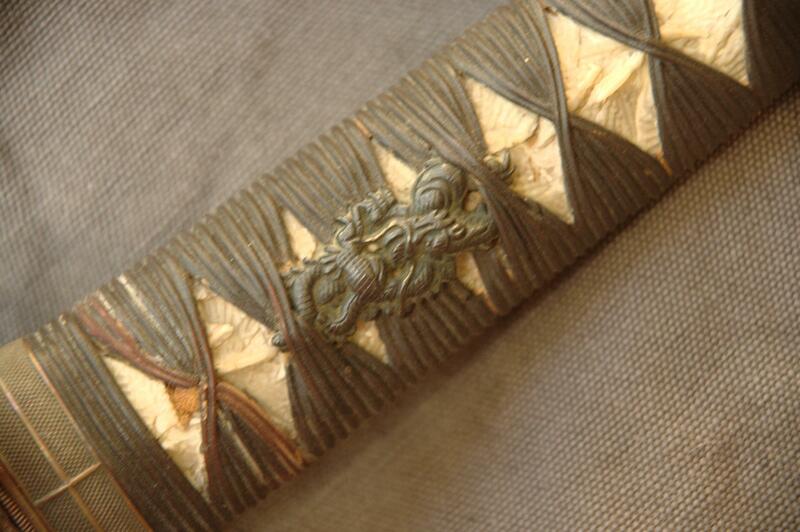 Handachi koshirae with carved copper tsuba, signed ko-gatana and dragon and sword kozuka, all held together with a tsunagi. 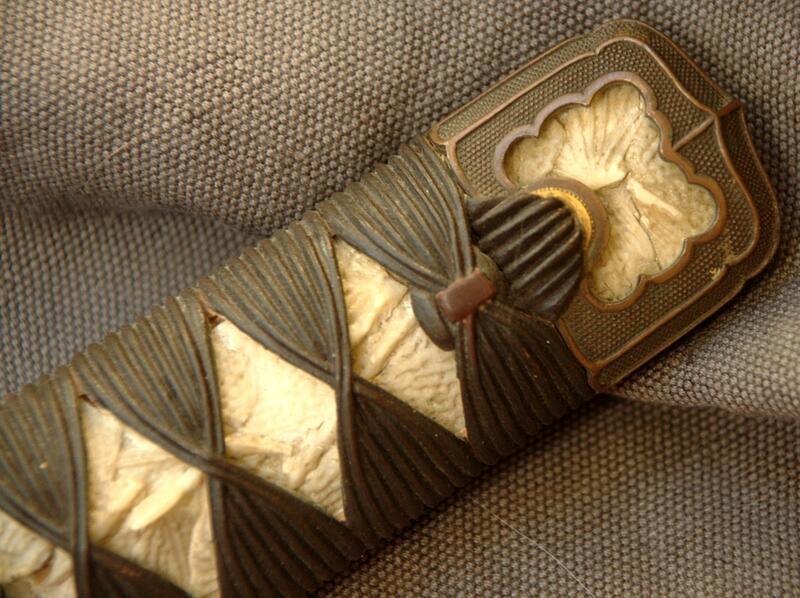 The imagery of the kozuka is from both Buddhism, particularly esoteric Buddhism, and Shugendo. The blade comes in a shirasaya. The origami was issued by Fujiyo Matsuo, a well-known Japanese sword expert. Kanefusa (KAN 732) was the son of Hisakatsu. 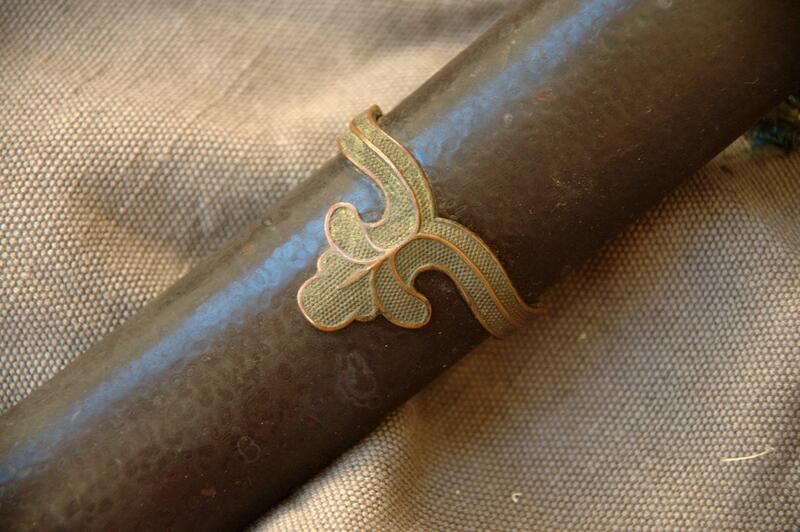 Kanefune was active from 1570-1596 AD - on the boundary of the Koto and Shinto periods - and mostly made tanto. Swords by him are thus uncommon. 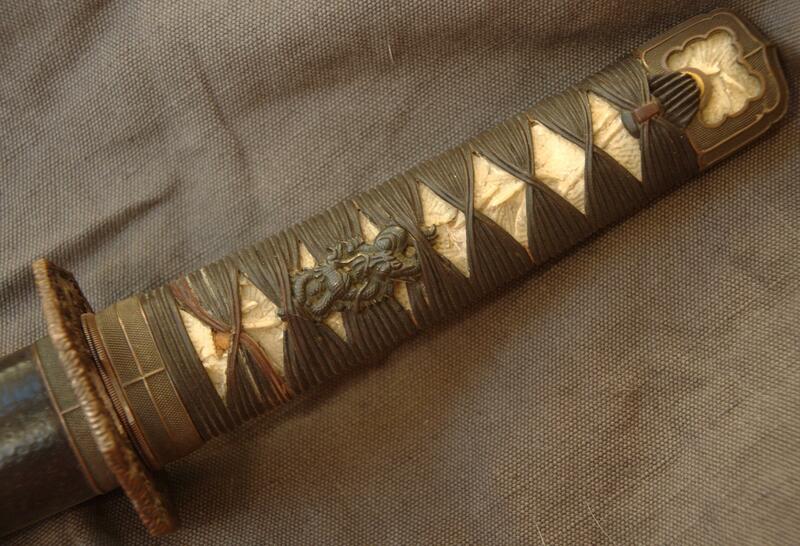 The origami dates the blade to 1580, which means that this wakizashi was forged in the later part of his career. Hawley rates him at 15 points. The Toko Taikan rates him at 2 million yen.